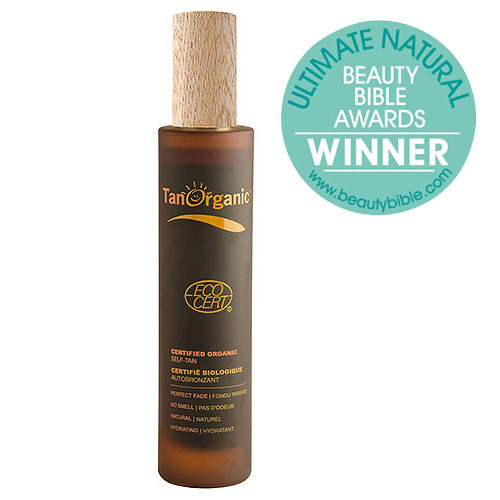 TanOrganic Certified Organic Self-Tan is a 100% natural and organic tanning solution to achieve luxuriously silky soft skin with a beautiful glowing professional looking finish. It’s anti ageing Aloe Vera based formula is moisturising to the skin and it contains no synthetic drying agents. The tan is ideal for those who care about what they are putting onto their skin. It is ideal for those with sensitive skin and also those who are expecting as it is free from harsh chemicals, parabens, colours and fragrances. TanOrganic Certified Organic Self-Tan works in the same way as any regular tan, only less is more; only a small amount is required for each application. you apply it with a glove or mitt and leave it a few hours, preferably overnight to develop and wash it off. It gives a lovely caramel shade but for those who prefer a darker look, just apply a second or third layer depending on the tone you prefer. Aloe Barbadensis Leaf Juice: Certified organic aloe vera leaf juice, Dihydroxyacetone (DHA): Derived from natural sugar, Gluconodeltalactone and Sodium Benzoate: Gluconodeltalactone Is derived from glucose and gluconic acid, Sodium benzoate is the sodium salt of benzoic acid and is widely used as a food preservative, Beta Vulgaris Root Powder: Certified organic Beet Root extract, Caramel: Certified organic caramel colouring from food grade carbohydrates, Sodium Hyaluronate: Derived from a microbial fermentation process of plant materials followed by a purification process, Citrus Aurantium Dulcis Peel Oil: Orange peel oil, Bixa Orellana Seed Extract: Certified organic Achiote seed, also known as annatto extract, Glycerine: Certified organic sugar alcohol, Buddleia Davidii Extract: Certified organic summer lilac extract, Thymus Vulgaris Extract: Certified organic thyme extract, Caprylic/capric Triglyceride: Derived from coconut oil, Xanthan Gum: Natural sugar thickener derived primarily from corn, Erythrulose: Ketone sugar derived from raspberries, Zingiber Officinale Root Extract: Certified organic ginger extract, Panax Ginseng Root Extract: Certified organic ginseng extract, Chamomilla Recutita Flower Extract: Certified organic chamomile extract, Tocopherol: Vitamin E, Mel: Certified organic honey, Citric acid: Organic acid found in citrus fruits. Preparation is key so wash and ex-foliate your entire body, paying close attention to trouble areas such as the knees, ankles and elbows where skin is drier. Next, add a small amount of Oil Arganic to buffer these trouble areas, this will ensure the tan doesn`t build up and leave you with the tell tale signs of a bad sunless-tan. Now its time to apply the tan, remember LESS IS MORE with TanOrganic, each bottle will do on average 5 – 7 full body tans. Apply a few drops, about the size of a €2 / £2 coin to the glove and make a fist about 3 times to allow the glove to absorb the tan. Start on your legs but leave your hands and feet until the end. Apply in circular motions starting on your calves and working your way up to your thighs, make sure you cover all areas, pay special attention to the knees and ankles and ensure that there is no build up in the creases. Remember to check hard to reach areas in a mirror so that nothing is missed – along the backs of the legs can be a common streak area. Allow the tan to dry and if you have missed any areas, you can easily blend in any lines. Apply as above to the rest of the body. When you are finished, check in a mirror for any lines that may not have been blended in. If you find any lines, just add a bit of Oil Arganic to the glove and blend them in. TanOrganic should be applied in light layers, do the first layer and let it dry for a couple of minutes, if you are looking for a darker look, apply a second or third layer. TanOrganic takes 6 to 8 hours to develop fully but its best to leave it overnight – the tan will develop every hour after application up to 8 hours and will last between 5 – 8 days. We recommend that you moisturise daily with Oil Arganic to ensure the perfect fade. Below are reviews of TanOrganic Certified Organic Self-Tan -100ml by bodykind customers. If you have tried this product we'd love to hear what you think so please leave a review. Very easy to use and a little goes a long way! 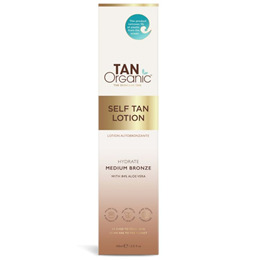 TanOrganic Certified Organic Self-Tan is a 100% natural and organic tanning solution to achieve luxuriously silky soft skin with a beautiful glowing professional looking finish. It’s anti ageing Aloe Vera based formula is moisturising to the skin.